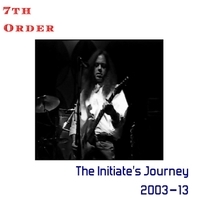 7th Order's "The Initiate's Journey, 2003–13" is a career retrospective "Mixed Media" CD...their most popular songs, plus alternate mixes, re-mastered songs, studio outtakes, a rare live performance of "100 Year Rain" from Seattle TV, interviews, radio broadcasts and more. "7th Order is an American progressive rock & roll band whose debut "extended play" CD release, The Lake of Memory, was issued on the Big Island Sounds label in 2007 (although 7th Order had been together for several years by that time). The band has, at various times, been assisted by veteran British guitarist Martin Pugh (formally of the 60's British "blues-boom" band, Steamhammer, as well as Armageddon with The Yardbirds vocalist Keith Relf, and "The Rod Stewart Album" with Ron Wood & Keith Emerson), drummer Tim Kelliher (of Randy Hansen's Machine Gun), and legendary American rock guitarist Geoff Thorpe (of Vicious Rumors). Reviewers have recognized their particular sound as reminiscent of blues-rock bands like The Rolling Stones & The Yardbirds, with progressive undertones ala Led Zeppelin".